It’s no secret that I love working with translucent polymer clay. It’s incredibly versatile and allows for some stunning effects. Making faux materials is one of polymer clay’s special tricks. Translucent polymer clay allows you to make faux glass that very much mimics the real thing. I’ve shown you how to make Faux Glass beads before, and now my newest tutorial will continue that trend. Learn the secrets of making Faux Lampwork. The 70 page tutorial has 143 photos that will take you through every step of making a Faux Lampwork pendant, doughnut bead, and tube bead. As a bonus, the tutorial also contains a section showing how to make headpins from polymer clay cane slices. These components can be made in any color that you wish, to coordinate with other beads and jewelry elements you use. If you’re not familiar with my tutorials, you’re in for a treat. I don’t just outline the simple steps and throw together a few pictures. You will always be provided as much background information as a subject needs. It’s easy to understand what is going on and why you’re doing what you’re doing. I look out for the pitfalls and alert you to problems so that you don’t face them. Every step includes detailed photos and there’s an Appendix with even more info. This is helpful if you’re new to polymer clay and need more explanation. 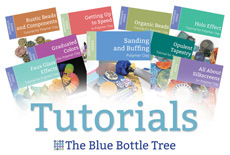 Finally, there’s a Resources section that includes sources for all the products used in the tutorial. This includes sources outside the US when possible. This tutorial is easy enough for those completely new to polymer clay. At the same time, it’s fun enough for those who have been claying for many years. I’ll show you how to make the projects in the pictures, but you’ll learn the technique so you can create designs of your own. No specialized products or tools are required to make Faux Lampwork. I give several methods to accomplish each project, so nearly everyone will already have the materials to complete the projects. For even more breathtaking results, I do suggest some more specialized materials and tools, so you might want to invest in those. But even those aren’t unusual to working with polymer clay and you might have them already. And finally, there’s a BONUS project that was so cool I couldn’t leave it out. Use what you’ve learned in making Faux Lampwork to make these really fun headpins from canes. It’s a great way to use those gorgeous canes you’ve been collecting. A pair of these headpins and you’re most of the way to some really special earrings, right? Go ahead and get started making Faux Lampwork. Pick up the tutorial in my Tutorial Shop. The PDF download is available right away, so you can get busy creating now. This interactive PDF can be read on any device. It is structured with navigation links throughout, making it easy to use. It’s also formatted to print easily if that’s your preference. You’re going to love this tutorial!